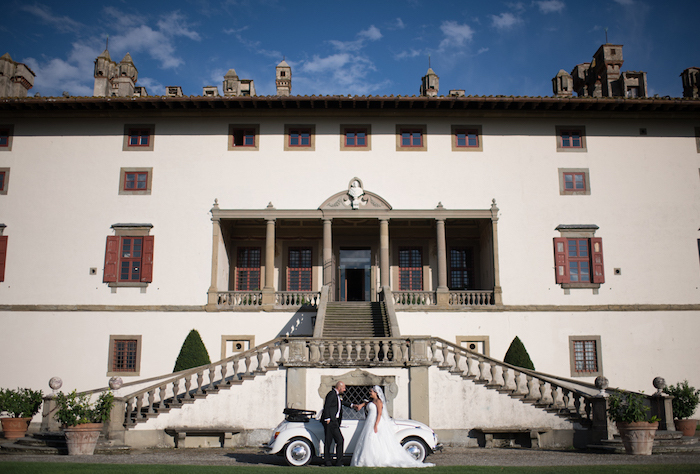 A Tuscan countryside destination wedding checked all the criteria for newlyweds Joyce and Alain, including gorgeous green scenery, amazing food and an intimate setting. “Alain and I wanted to have a small wedding and we knew that we could not do that choosing our home country,” the bride says. 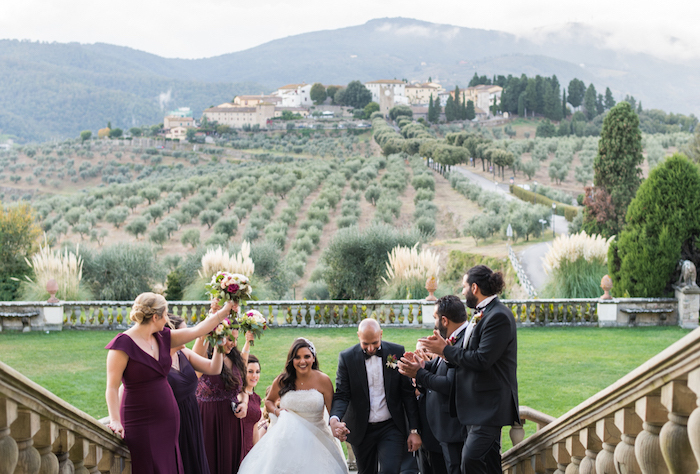 Because the couple hadn’t visited Italy beforehand, they figured Tuscany would be a safe bet for ensuring the best food and a beautiful location. “The other main reason I chose Villa Artimino was because it was the only venue that could accommodate all my guests, which was a huge factor throughout planning a destination wedding,” says Joyce. With guests attending from different parts of the world, the pair wanted to ensure the occasion was everything they had dreamed of. To symbolize the glory and honor bestowed upon them, the bride and groom took part in a traditional Maronite church wedding which included a crowning ceremony. 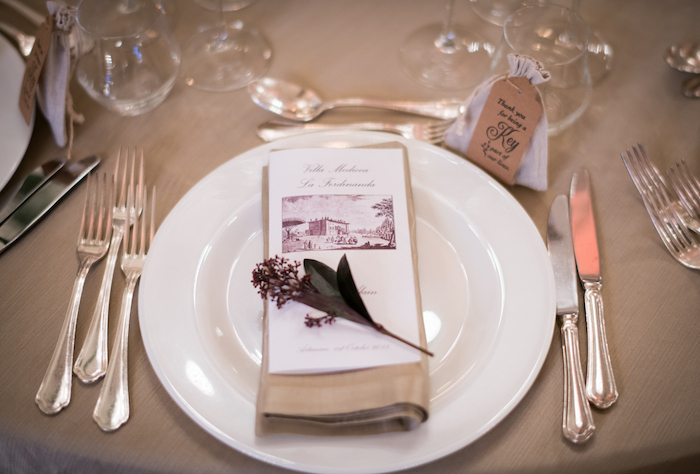 The vendors played a huge role in helping the couple achieve their perfect day, including delicious catering from Villa Artimino. Guests were treated to a variety of flavorful cheeses, breads, salads, pastas and pizzas in the romantic, candle-lit atmosphere of the reception. For dessert, attendees enjoyed sweet lemon and strawberry sorbet along with the elegant yet delicious cream and berries wedding cake. Along with the intimate lighting, gorgeous florals decorated this wedding with white, ivory, blush, peach and maroon arrangements from Flowers Living. These colors complimented the lovely maroon dresses of the bridesmaids who looked stunning against the breathtaking green backdrop of Tuscany. Throughout the night, guests danced to their heart’s content under sparkling chandeliers to music from Matthew DJ. The couple and their loved ones were also able to take fun pictures with props in a photo booth. Alain & Joyce - Wedding Trailer in Villa di Artimino from Milaneschi Films on Vimeo.